This is probably one of the best war documentaries I've ever seen. As someone from Japan and now lives in Melbourne, it's very heavy and painful to watch. Based on a book by Paul Ham, who also wrote 'Hiroshima Nagasaki', it traces the history of this brutal campaign to counterattack Japanese advance on the island of Papua New Guinea. 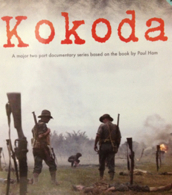 Using very clever reenactment, historical footage, interviews by both Japanese and Australians, he takes viewers deep into this savagery, forcing us to think about the meaning of the war, life and death.